Romantic, dramatic and sensational, this 'piece' takes inspiration from 1940s vintage hair combs. 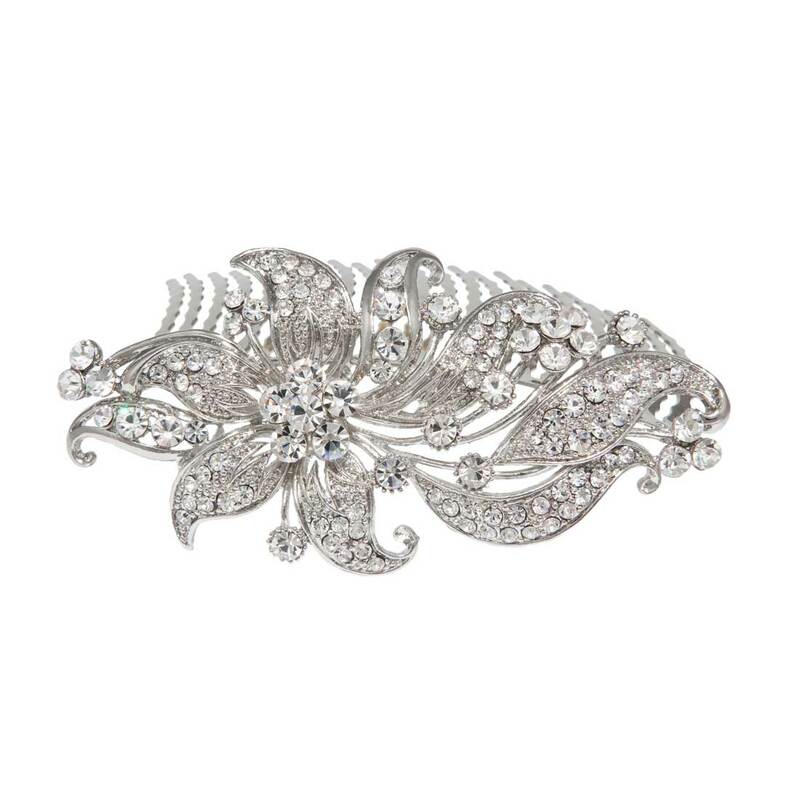 Utterly sensational, this large statement hair comb oozes 1940's Hollywood classic glamour. 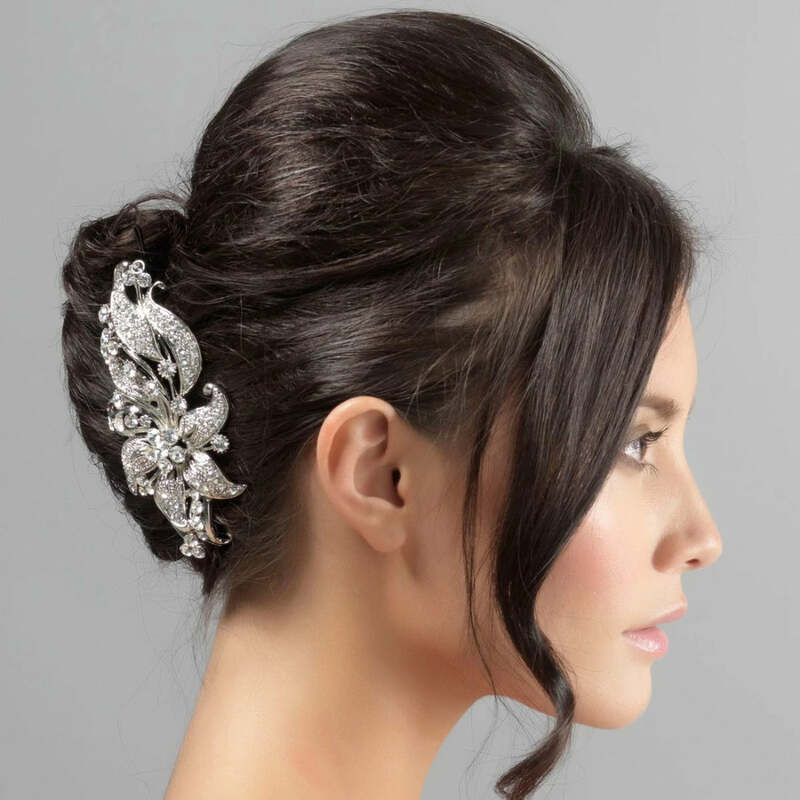 Featuring a trailing lily design encrusted with sparkling clear Austrian crystals, this silver tone hair comb is a show shopping 'piece'. Perfect for thicker hair types and up-do's, it can be worn alongside the fold of a French pleat, at the side of the head above a low side bun or off-set in a chic chignon. Simply coordinate with a pair of crystal drop earrings and a crystal encrusted bracelet for movie star style. Brides will adore this 'piece' as an alternative to the traditional tiara. Compliment a vintage inspired bridal gown with a touch of timeless glamour. I was going for a 'Hollywood glamour' look with my hair and makeup, and this comb was the perfect accessory. I have fairly thick, long hair so the comb worked brilliantly for me. It is quite heavy so the hairdresser fixed it with lots of grips and it stayed in place for the whole day, including a lot of dancing. If you have fine hair it might be hard to keep it in though! I bought this comb for my wedding later this year! It is absolutely stunning! Even more beautiful than it appears online and the quality is amazing! I keep taking it out of it package to admire it! I can't wait to wear it!